Ever watch a movie or show on demand? Then you might have used Winchester’s gangmate chicklet connector! The gangmate chicklet connector is used in data infrastructure systems across the United States. It’s most common application is within Arris’s video audio data routers. With variations of 12-24 positions, the connector is customizable based on application and provider. It’s durable self-guiding pins align the connector before mating, helping ensure longevity. The gangmate is actually made up of chicklets, which are placed on the connector frame. The Winchester Interconnect 75 Ohm modular RF Blind Mate interconnection system allows the user to combine up to 200 RF contacts into one package measuring 457mm (L) x 25mm (W) x 20mm (H). 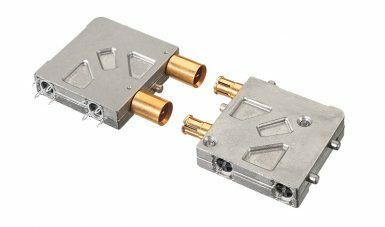 The robust mechanical design provides an axial mating tolerance greater than 2mm and is ideal for blind mate systems requiring dense RF packaging.